When we talk about global track and field, every day matters. This was the year that every male sprinter was to establish himself. We saw it with Noah Lyles, the 21-year-old American sensation and fastest man in the 200 metres at 19.65 seconds. His teammate, Ronnie Baker, boasts a world-leading 9.87 in the 100 and four Diamond League victories in 2018. 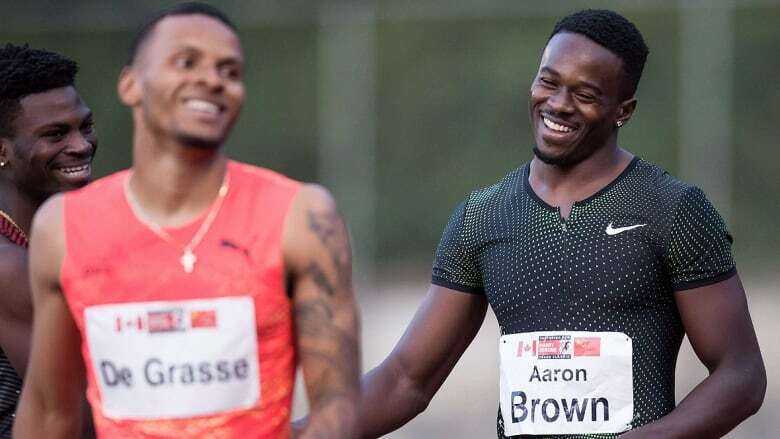 In Canada, the big storyline has been the apparent decline of Andre De Grasse, the triple Olympic medallist in 2016, and the rise of Aaron Brown, whose 2016 and 2017 campaigns were plagued by injury and lane violations. It has been an off year for De Grasse, who saw his season cut short at the Canadian championships in early July by a second hamstring strain in 11 months. But I'm certain he'll be much hungrier next year and will rebound. If you only look at his times from earlier this year, the body of work is quite mediocre and Andre, I'm certain, is unsatisfied. Some of the races he entered and lost, it appeared like race rust. Maybe he couldn't train properly, and that could lead to race rust. If you're not ready, your competitors aren't waiting for you. After running a legal season best of 10.01 in 2017, a seemingly healthy Andre returned to the track in late April and clocked 10.15 in the 100 at Drake Relays. He was slower in Shanghai (10.25) and at the Harry Jerome Classic (10.36) in Burnaby, B.C. ahead of nationals in Ottawa, where he went 10.20 before suffering a Grade 2 strain of his right hamstring in the 200 semifinals. I can't criticize an athlete if they say they're injured. Only Andre knows what his body is going through and what the training protocol is. He'll have to get stronger this off-season and put on weight, and his first 30 metres probably needs work. Coming off the initial hamstring injury, which forced him to withdraw from the world championships last August, I thought Andre was going to run indoors in the spring to work out the kinks and some technical aspects. What I did at the start of each season, regardless if I was coming back as the champion, was run indoors and take forward steps from the first race. Andre should run about five 60-metre races indoors in the winter, run a couple of relays in March and April, double up in the 100 and 200 early in the outdoor season, establish good times and let everyone know he's ready to contend for a title. Next year's world championships are quite late, Sept. 28 to Oct. 6, so it's going to be a long season. The fact Andre was injured this season might actually work out very well for him. He'll have to establish himself next year and win, but there are eight to 10 guys who have established themselves this season as challenging for the title of world's fastest man. Hopefully, he can get a gold medal at worlds and follow it up with an Olympic gold at Tokyo in 2020, but it won't be an easy task by any stretch. It would be easy to say Brown was simply the beneficiary of Andre's lost season, and there could be some legitimacy to it, but I feel such a claim is off base. What Aaron is doing now, running with confidence and flirting with the 20-second barrier, is what I believe he should have been doing before Andre burst on the scene in 2015 by winning the 100 at NCAA championships and Pan Am Games in Toronto. I love the fact Aaron has a lane in the 200 at the Diamond League final in Zurich on Thursday (race time is 3:11 p.m. ET). After watching him 10 years ago as a 16-year-old in Scarborough, Ont., I thought he should have been a 19.90-second or 19.80 guy last year and was expecting him to make the 200 final at worlds. He took advantage of this season being an off year for the world championships and Olympics and has gained a better understanding of the pressures of competing and using each race to build strength and minimize his weaknesses. At the recent NACAC championships in Toronto, Aaron helped Canada's men's 4×100 team to relay gold and also revealed the final 50 metres of the 200 continues to be his "nemesis" this season. But the No. 1 thing is he knows it's a technical glitch. He also needs to understand what to do breathing-wise and not panic and worry about the competition. In practice, I think he needs to do speed endurance running between 180 metres and 220, carrying his full speed to 180 and up to 220. He needs to execute all the technical things he has been taught, use all the strength and power he's gained in the gym and put one foot in front of the other. It's real simple. Aaron definitely is the fastest guy in Canada, with his 19.98 performance on June 7 at the Bislett Games in Oslo, Norway, and next year I think he will only improve upon what he has done this year.